I can’t think of one instance when a person who came to the church building for material assistance has gone on to become a fruitful follower of Christ or even a productive member of society. By the time a person has resorted to soliciting aid from an institution they have burned enough bridges in their lives that they have no friends to call upon any longer. They have adopted lying as a survival skill and the web of their own lies makes them nearly unreachable. For this reason, I don’t consider church benevolence to be effective. 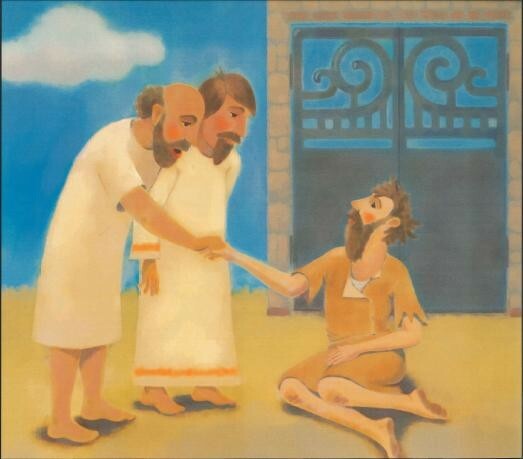 Jesus knew this would be the case so he sent his people out as beggars. He told them to take no wallet or even a cloak. They were to announce the coming of the kingdom of God and accept hospitality from those to whom they preached. The Son of God himself followed this same protocol. He came not as a king or even as a relief worker but as an itinerant preacher who lived off of the generosity of others. The church can no longer say, “Silver and gold have I none.” and the beggars of this world know it. So, they come to us with hands out, nearly demanding that we part with our surplus because we’ve taught them to expect it. Should we comply, they drag their crippled lives away from our door no different than when they came. But what if the church went into the villages of our day – the workplaces, neighborhoods, bowling alleys, schools, etc. to proclaim the coming of the kingdom. What if we actually believed that through our faith in the name of Christ that the sick could in fact be healed, the dead raised, and the oppressed set free? If we did that, I have to believe that we would see real life change and honest community form out of it. In that honest community we’ll be free to share what we have since we’ll actually know the person across from us. We won’t find ourselves enabling the dysfunction in the world if we require that people come out of the world. So, here’s the point. Let’s give more of our resources to the needy among us. Let’s offer the message of life to those on the outside without the need for apology or bribery. As we offer that message, let’s expect that Jesus will make good on his word to be with us (in all his grace and power) until the end of the age.